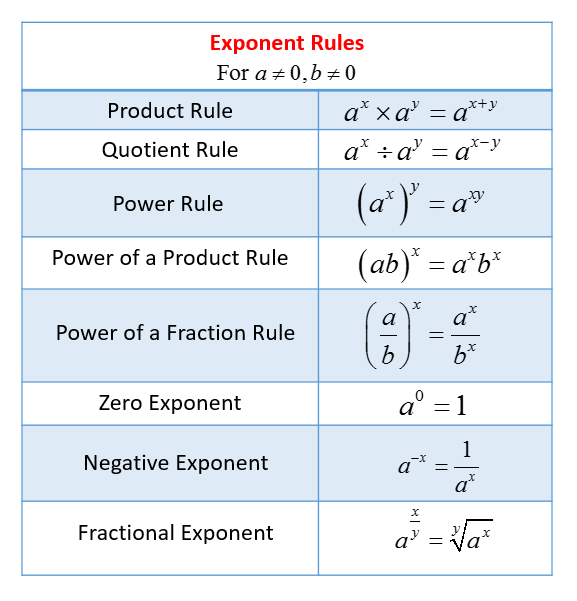 The following figure gives the Rules of Exponents. Scroll down the page for examples and solutions. How to understand the vocabulary of exponents. There are different rules to follow when multiplying exponents and when dividing exponents. If we are multiplying similar bases, we simply add the exponents. If we are dividing, we simply subtract the exponents. If an exponent is outside the parentheses, it is distributed to the inside terms. It's important to understand the rules of multiplying exponents so that we can simplify expressions with exponents. The following video is on Dividing Powers in terms of the Exponent Rule. The following video is on the Exponent Rule of a Power of a Power. It's important to understand what It means to have negative exponents and zero exponents. Negative exponents put the exponentiated term in the denominator of a fraction and zero exponents just make the term equal to one. We can use negative exponents for canceling with positive exponents while solving equations or simplifying expressions, although we need to keep in mind the rules of multiplying exponents. This video explains negative exponents. We can use what we know about exponents rules in order to simplify expressions with exponents. When simplifying expressions with exponents we use the rules for multiplying and dividing exponents, and negative and zero exponents. In Algebra and higher math courses such as Calculus, we will often encounter simplifying expressions with exponents. These videos provide examples of simplifying exponential expressions using a several exponent rules (positive exponents). These videos provide several examples of how to simplify exponential expressions containing negative exponents.